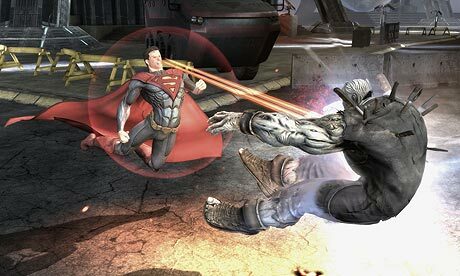 NetherRealm Studios’ upcoming DC Universe brawler, Injustice: Gods Among Us, hits in the U.S. on April 16 (followed by Europe and Australia a few days later), but that won’t be the first time you’ll be able to get your hands on it. Publisher Warner Bros. announced plans to release a demo for the game on April 2 (April 3 for Europe) on the Xbox LIVE Marketplace and the PlayStation Network. The game’s full roster of DC Comics characters won’t be available in the demo; players will have the option of playing as Batman, Wonder Woman or Lex Luthor. Only one of the game’s many destructible environments, set in Batman’s home base of Gotham City, will be available in the demo. Along with the announcement, NetherRealm released a new trailer for the game, this one featuring archer Green Arrow going toe-to-toe with ancient Egyptian powerhouse Black Adam. Other playable characters will include Aquaman, the Flash, Doomsday, Sinestro and others. Injustice is set in a dystopian version of the DC Universe. After the Joker kills most of Superman’s friends and family – and tricks Supes into murdering his pregnant wife, Lois Lane – the Man of Steel goes off the deep end, ruling the planet with an iron fist alongside Amazon warrior princess Wonder Woman and a crew of loyal heroes. Another sect of heroes, led by Batman, begin a resistance movement against Superman, with the supervillains thrown in for good measure. The game’s story has shades of the seminal Kingdom Come storyarc by Mark Waid and Alex Ross, but centered less on philosophic ruminations on power and apocalypse and more on dudes punching each other through walls. With the game’s release just a couple weeks away, are you excited for the game? Still on the fence? Let us know in the comments below.